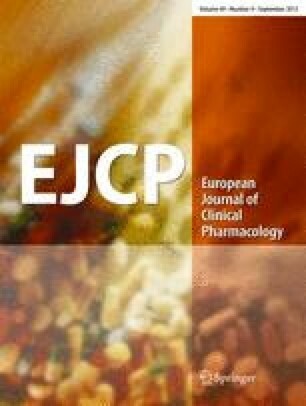 Objective: A possible pharmacokinetic interaction between a CYP1A2 inhibitor, ciprofloxacin, and clozapine was studied in schizophrenia patients with stable clozapine treatment. Methods: A randomised double-blind cross-over study design with two phases was used. Seven schizophrenic inpatients volunteered to receive, in addition to their previous drug regimen, either 250 mg ciprofloxacin or placebo twice daily (b.i.d.) for 7 days. The phases were separated by a 7-day wash-out period. Serum concentrations of clozapine and its main metabolite N-desmethylclozapine were measured during both phases before the first dose on day 1 and on days 3 and 8. Results: Ciprofloxacin increased mean serum concentration of clozapine and N-desmethylclozapine by 29% (P<0.01) and 31% (P<0.05), respectively. There was a significant positive correlation (r=0.90, P<0.01) between the individual concentrations of serum ciprofloxacin and the increase in concentrations of clozapine plus N-desmethylclozapine. The increase in serum clozapine concentrations correlated significantly (r=0.89, P<0.01) with the ratios of N-desmethylclozapine to clozapine concentrations. Conclusion: Even a low dose of ciprofloxacin can moderately increase serum concentrations of clozapine and N-desmethylclozapine. A probable mechanism of interaction is an inhibition of CYP1A2 enzyme by ciprofloxacin. The possibility of clinically significant interaction should be considered, especially when higher doses of ciprofloxacin are used concomitantly with clozapine.